After 21 years, I have the opportunity to go back to my first school teaching assignment in Caiñaman Elementary School not as a teacher nor a school principal, but as a chief examiner of the first Division Unified Test for the Grades 2 to 6 pupils of the said school. This is something to reckon with, something to value and something to share it. I couldn't control myself from shedding a tear upon entering the gate of Caiñaman Elementary School, Division of La Carlota City when I conducted the first division unified test there together with my present teachers in Cubay Elem. School. CES was my first school assignment as a classroom teacher in 1991. I was a relief teacher, handling Grade 5 and Grade 6 subjects like English, Mathematics, Social Studies, Elementary Agriculture, Industrial Arts, P.E., Music, and Arts. 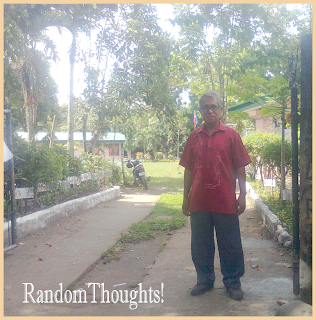 I was also assigned as a property custodian, Boy Scout coordinator and Non-Formal Education coordinator of the school. I was teaching there for 7 years and later was transferred to central school, La Carlota South Elementary School 1 for 2 years until I was promoted to head teacher 3 and finally principal 1. After I supervised the conduct of testing in CES, I proceeded to her extension at Bagumbayan where grades 2, 3, and 4 are held there. It took me 20 minutes in going there as I rode tandem with motorcycle service of Mr. Gregorio Mahilan, one of the teachers in CES. 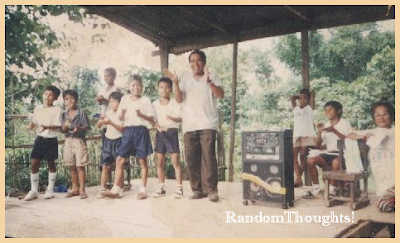 When I arrived there at Bagumbayan, I was more emotional for I was reunited with my favorite pupils before like Jennifer Jalandoni, Noonday Salmorin, Demacuta and Jungco. I shoke hands and hugged them and felt very happy. I really miss our good moments and trying times when we were at the main campus of CES and I was their teacher. What will be your feeling when you go back to your first school assignment, your first classroom after 21 years? What will be your reaction when you step again on your garden where you've planted all kinds of vegetables? I got a mixed feeling of emotion. As I went straight to my first classroom, I checked the blackboard and looked for the spot marked by my right hand when I boxed it after getting fed up of non-comprehension of my grade 6 pupils on their mathematics subject. I dismissed them 15 minutes past noon. I remember when one of my unperturbed boy pupils asked me saying: "Sir, masakit man?" [Sir, did it get hurt?] I replied, "Yes, it hurts!" I also went to the stairs near the principal's office heading to my classroom. That stairs were the usual venue where I spent my vacant time, pondering things about my teaching outcome, my problems in school and my personal and family matters. CES was not only my first teaching school, but it was also my first school assignment as a head teacher. It was where I discharged my school administrative function as a head teacher, similar to a school principal. The only difference is the limited number of teachers being supervised. 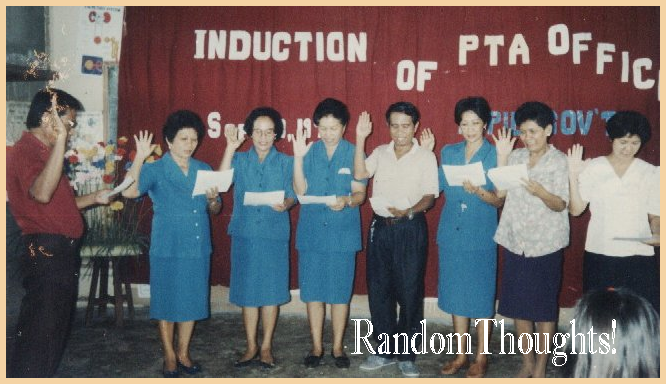 My co-teachers like Mrs. Susana Nabor, Grade 1; Mrs. Ninfa Ganza, Grade 2; Mrs. Nelly Salvacion, Grade 3; Mrs. Pacita Gonzales, Grade 4; and Mrs. Girlie Cabrera, Grade 5; and Mrs. Teresita Montales, Grade 6 were surprised that I took over the position of our former school head, Mr. Vicente Mental who retired. They never expected that their co-teacher will manage their school. They thought that I am just a regular classroom teacher with no educational management experience and skills. As I entered the office of the school principal, tears gradually fell from my eyes. As I wiped those tears I told my 5 teachers whom I brought along with me as room examiners that this office was my office 13 years ago. This is where I had assisted and solved the problem of my grade 4 teacher about her hubby through a fervent prayer and faithful spiritual counsel. CES has molded me as an effective and full-fledged school principal. It touches my life, my family and my outlook in life. Caiñaman Elementary School realizes my ambition as a teacher which was my first choice of vocation and later raised me to the height of a school administrator. I consider this as the best life experience I ever had. Thank you, Lord that I was an instrument of molding these kids. I was inspired of doing this because of you. Going back to this school for 21 years later is a fulfilled task of being a teacher and a school head in the field of education. How I wish I could do the same. unfortunately, it's been affected by typhoon and earthquake. What a great journey you had as a teacher and now principal. It's really admirable how you can write in vivid details when it comes to your past experiences. Thanks Franc for such observation you've had. It's interesting, and more than fun to recollect things of the past, especially when you personally experienced them. You can learn from such happy or even unusual happenings that ever occurred to your life. Agree the past is a time stamp which we can always relive and see how things evolved to where we are at the present. It must have been fulfilling to see all those successful students in all your years teaching. Mom was a public school teacher in her entire working life. She's now retired. When I was very young, there were times that she tagged me along to her school. She also used to ask for help in checking test papers. Fond memories. When you retold your story, I also remembered my first few years at my alma mater, St. Anthony School where just a couple of days ago, a couple got wed with the flood as their principal sponsor. I remember back when the days that the I went to that school and that church (beside it). Just like you, I still have a clear picture in my mind all the experiences I had there... the good times and of course, the bad ones too. But for a total of 11 years that I stayed on that school, I was molded into the person I am today. I guess, a big part of who I am can be attributed to my teachers. They weren't perfect, but they did try their best. And for me, I will always be thankful for that. Reminiscing the past and reuniting with old students, what a good feeling! There is really something nostalgic about returning to a place that has a lot of significance for you. Sometimes, it also mixes with a feeling of being surreal. That was how I felt when I returned to my high school four years after I graduated to help out with the drama club. It felt surreal and even weird knowing that it was just four years ago when I was just one of the students, and now here I am, teaching them. Walking the same path you walked after so many years is, indeed, a circumstance that elicits mixed emotions in a person. I had the same experience a few months back when I visited my high school alma mater and saw my former classmates after a long time. The feeling was priceless. Very nostalgic. 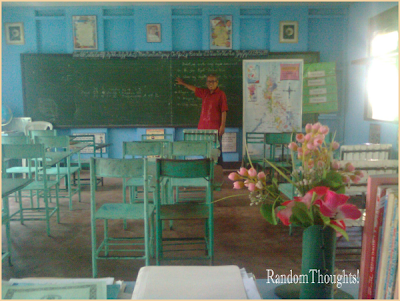 I salute teachers who can still remember their students no matter how many there were....It surely will bring you back memories, walking down on its lane, literally and figuratively. How I wish my father will do the same story like yours. 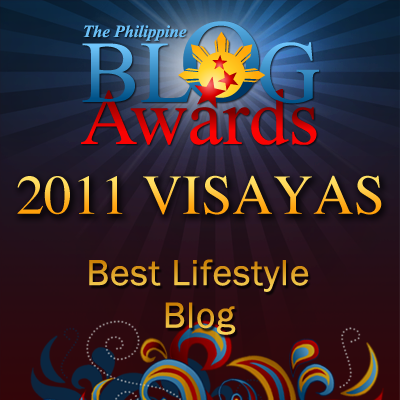 Very nice blog. I have a huge respect for teachers and that includes u. It's always nice to go back to where u started your carrier and see some of the people u used to know when your there. the first things are really hard to forget... it's good to look and go back to places where we started. Yahweh bless. Reading your story made me miss my academe life although its only been almost a year since I stopped due to some reasons. I really feel like going back and learn together with my students. Glad to read about your life in the academe. Way to go Sir Gil!. Good job! I admire your beginnings and how you have achieved your dreams. I think I would have felt the same way given the same circumstance. Great feeling of fulfillment and success! Congratulations Sir! Congratulation sir Gil for the fulfillment of your dreams, you may not realized it yet, but you also became part of the many kids' lives and the realization of their dreams..
Wow 21 years! Congrats sir! So proud of what you have accomplished you are such an inspiration. Goodluck sir. We always want to go back to our past and bring back the sweet memories of our youth. Thanks Sir Gil for showing us to just to do it because of the great treasures that await us. Congrats sir! 21 years of service by teaching. I'm sure there are a lot good memories here.We all should be proud of our Teachers. Wow! This is really something, sir! Congratulations sir Gil. Indeed you are a great inspiration! Sir, this post made me teary-eyed :( i so remembered my mom. she's an elementary teacher here in our place. unfortunately, she passed away ten years ago. your an honor to this country, Sir. I salute you. As I salute my former elementary teachers. I get to see them from time to time in the town proper. I wished all teachers/principals could be like you, Sir. My father is a retired MT1. And I know the hard work you've done in order to get to where you are now. Nice idea on going back to the place where you started. I salute you for that. I respect all EDUCATORS. MABUHAY po kayo!